A painful reality check is necessary here. In the days when many people lived on farms and TV options (if you had a set) were limited to three choices, the music and special events put on by the church were a big deal in the community. In the days when no one had attended a live concert or watched a streaming one, the Living Nativity Scene (complete with animals) at church was awe-inspiring and the Easter Musical was magical. Not so much today. If the overwhelming impression a visitor has after leaving your church is that you tried to be impressive, but the drama was, in reality, painful to watch for anyone not related to the actors, or the music lyrics (repeated endlessly, so it can seem) were only meaningful to those inside the church, they won't come back. The bar is very high today for what will impress a nonchurched audience and realistically most churches won't win in this area if an impressive performance in your primary goal and supposed motivation to get people to come back. If you do manage to do a high quality event, that has its own challenges because people may come back expecting impressive entertainment like that every week, not realizing you worked on it for six months. Again, if the spectacular is what you emphasize--not that it's wrong to do it for Easter, but if that is promoted as the most important thing at your church if you don't produce a similar production every week, visitors will move on to the currently most entertaining church. Technology can stream data and spectacular entertainment and music to anyone, anytime on a variety of computer devices, but it can't give a hug, grasp a hand or offer a listening ear. People today may be stuffed with entertainment excellence, but eye candy won't ever satisfy an empty heart. No matter what you do for your Easter service if a visitor leaves with the impression that in this place people are caring kind people who are sharing the Words of Eternal Life and that Jesus, maybe, just maybe, really did rise from the dead and can save those who believe in Him, they may come back to hear more of the message. Unchurched people, especially people who didn't grow up in a church mindset, do not know that you want them to come back if you don't make it very clear you want them back. It might seem obvious to you, but it isn't to them. In reality, many of our communications give them the opposite message. We are often not aware unless we work very hard on this that many of the things that churches do during their services and many of the items printed in the bulletin scream "Insiders Only" to a visitor. If you find yourself protesting that statement, think about what communion means to a totally unchurched person, who (no disrespect intended) cannot figure out how little snacks of crackers and juice have anything to do with Jesus and Easter. Look at your bulletin announcements with the eyes of an unchurched person: what do invitations to Awanas, MOPS, Riptide, DRIVE, or Encounter (all real church programs) mean to them? If you don't make an effort to explain what these terms mean to a visitor, why would a visitor assume you want them to come back to church? One more thing here: if the only time you send out an invitation to church is for the holidays, if they don't hear from you at other times, how do they know you want them to come to church at times other than holidays? If you only send them an invitation to the special event and they come to your church, but there is no follow up, the unspoken message is they came to the service and that's all you wanted them to do. No matter what you do on Easter Sunday from the simple to the spectacular, don't assume that your Easter Service in and of itself will bring people back to church the following Sunday. One simple communication tool can greatly increase the chances of people returning and that tool is a Connection Card. A connection card doesn't have to be fancy or complex, in fact, for it to be most effective for a special event, the more simple, the better. 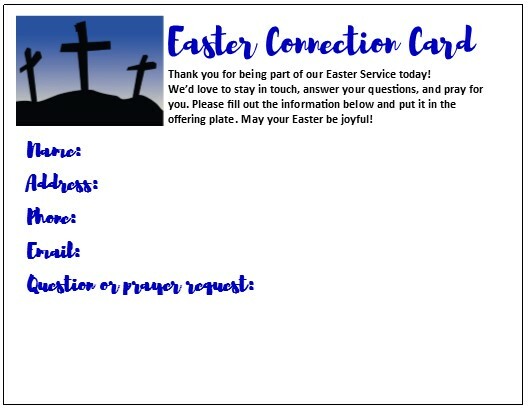 Based on the information collected from this card you can follow-up with emails and postcards, or the social media of your choice, plus links to where to find more information to explain your church, ask if visitors have questions, and invite them to future events. 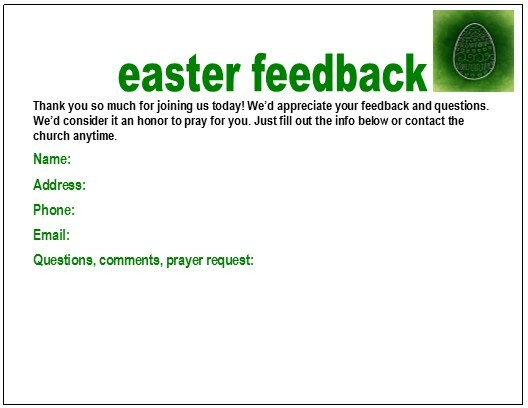 You can also call it a Feedback Card, which sounds less threatening to some. The name, however, isn't nearly as important as that you use one. Connection Cards are essential because you won't even know who is there and how to reach out if people don't fill out a Connection Card. These need to be a priority for you to make and to announce at the service. The book, Church Connection Cards, connect with visitors, grow your church, pastor your people, little cards, big results will give you detailed advice on how to make the most of them. CLICK HERE to go to the book on amazon.com where it's been the best seller of all our books. Why ask for a prayer request on the Connection Card? This is one of the most important parts of the card because it takes the card from being something that only benefits your church to a way that you can give back to the people who submit the card. Very few people outside the church have someone who prays for them and yet many surveys show that people from all spiritual orientations believe in prayer. 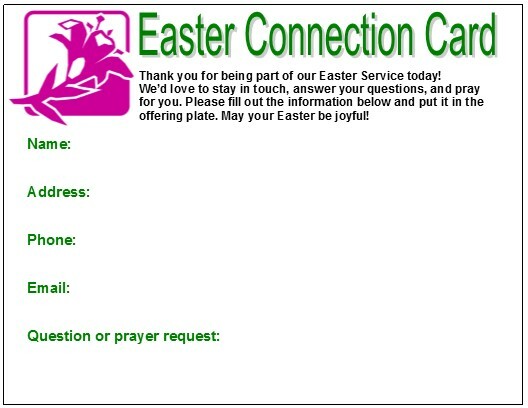 Be sure to point out the place for prayer requests on the connection card and assure your audience that it is your joy and privilege to pray for them. To have a member of your prayer team follow-up with a personal email and tell the visitor that they were prayed for, ask about how they are doing, and offer to continue to pray regardless of whether the person visits the church or not is a powerful way to share the love of Jesus. Below is a set of Connection Cards ready to print and use. Below the pictures is a ZIP file that has both ready-to-print PDFs and editable MS Publisher files. 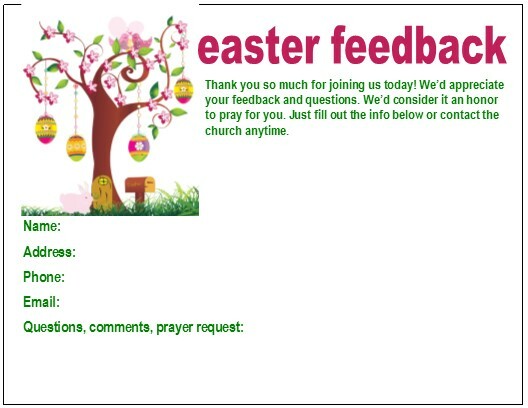 They have worked so well in everYou don't have to have lots of money, an incredible facility, or spectacular program to connect with people, this Easter or on any Sunday. 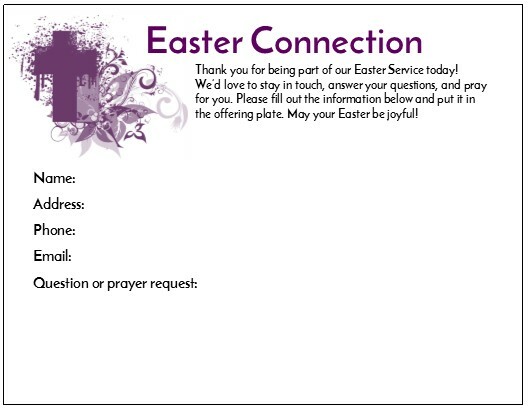 Simply create a connection card, be intentional about how you present and collect them, respond promptly and personally with invitations to return and regarding prayer requests and people will come back to your church. CLICK HERE for Amazon.com paperback. This book is available in e-book for immediate download and in print.